ALTON HUNTER was born and raised in Owen Sound. He purchased and opened a BP gas station in Kitchener. He sold that business to his brother Gord Hunter and opened an automotive parts supply store in Kitchener. 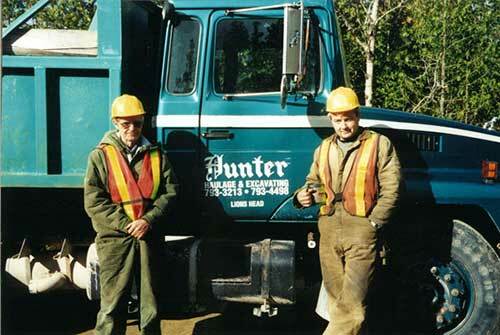 Hunter Haulage was established in 1968 when Alton Hunter relocated from Kitchener back to the Bruce Peninsula. He purchased land in Mallory Beach and Jacksons Cove then started his business with a single axle dump truck and a crawler loader. He built subdivision roads and completed lot preparation of the tile beds, septic systems, shore wells, digging for foundations. He also was a Haliday Homes distributor. Alton married Elaine Brant and together raised two children; Sheri and Troy. Sheri perused her dream career in the movie business and now lives in Vancouver. Troy got involved in the business around the age of 12 and started his own business called Hunter Rock in 1996 when he was 30. Hunter Haulage and Hunter Rock amalgamated in 2002 at which time the business became incorporated to the new name Hunter Haulage & Excavating Inc.
Hunter Haulage & Excavating Inc. brings a wealth of knowledge being in business for over 45 years.